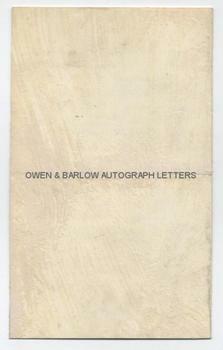 EDWARD POYNTER AUTOGRAPH LETTER Signed. Sir Edward John Poynter R.A. English painter and designer. Succeeded Millais as President of the Royal Academy. ALS. 3pp. 28 Albert Gate, S.W. January 20th, 1897. 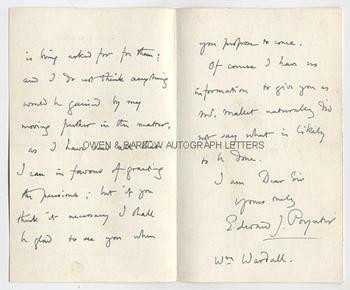 To William Woodall M.P. 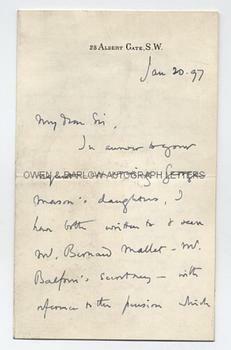 "In answer to your request concerning George Mason's daughters, I have both written to and seen Mr. Bernard Mallet - Mr. Balfour's secretary - with reference to the pension which is being asked for for them; and I do not think anything would be gained by my moving further in the matter, as I have said all that I can in favour of granting the pensions; but if you think it necessary I will be glad to see you when you propose to come. Of course I have no information to give you as Mr. Mallet did not say what is likely to be done." 12mo. Approx 7 x 4.25 inches. Mounting traces on verso of second leaf, else fine. From the 19th century collection made by the radical Liberal M.P., William Woodall, who was also a trustee of the Wedgewood Institute. The George Mason referred to by Edward Poynter is probably George Hemming Mason, the English artist and friend of Lord Leighton. Mason had died in 1872, leaving five daughters who, it seems, had fallen on difficult times and were in need of a public pension. In the 19th century, such pensions were only granted to the families of deceased persons of public prominence and merit (such as celebrated writers and artists) who were able to demonstrate financial hardship. Woodall was a great supporter of the arts and also of social rights for women, and was frequently involved in such claims. Edward Poynter, it seems, had been persuaded to intervene in support of the claim.